OPI's Suede collection is in my top 5 favorite collections of all time. I know there are new nail polish lovers who are lemming this collection out there and my recommendation is get them at all costs! You want these, they are gorgeous. 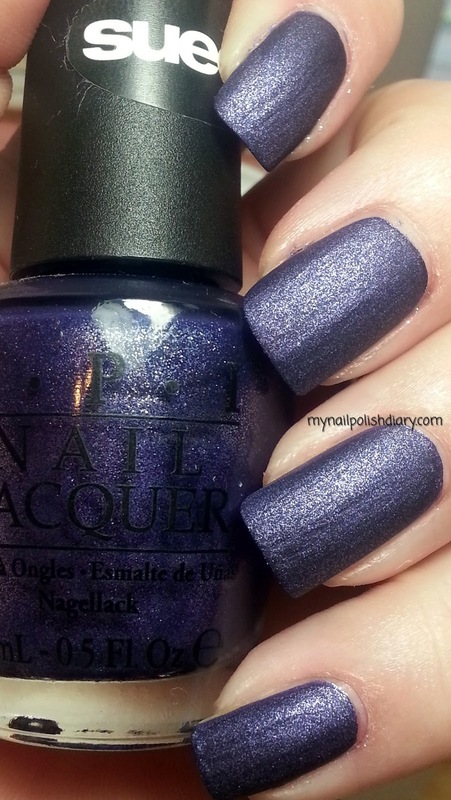 OPI Ink Suede was released in the fall of 2009 Suede Collection. While I am not a huge matte lover I love the "suede" mattes from OPI, Zoya and Man Glaze due to their shimmer. It is so dang pretty! The indigo blue with the silver shimmer is just TDF! Love this polish. I don't normally wear blue well with my skin tone but OPI Ink Suede is an exception. Even if it didn't look good I'd have to just wear it anyway. I think it looks denim. And this southern girl loves denim. I'm planning to get the entire collection blogged in the next two weeks or so then do a post with the entire collection. I think I'll do this with all my top favorite collections. I am also not a big matte (nor texture) fan but I adore the OPI suede collection and own them all!